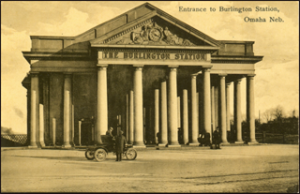 The Burlington Train Station, located at 925 South 10th Street in downtown Omaha, Nebraska is a historically and culturally significant landmark, and is listed on the National Register of Historic Places. When it was opened in 1898, this Italianate style building, designed by Thomas Rogers Kimball, was hailed by newspapers around the world for its grand architecture and accommodations. Look behind Toast’s bar and discover the cabinets that were reclaimed from the Burlington Train Station. We extended the height of the bases and added glass racks but everything else is in the same condition as when it was pulled out of the station. 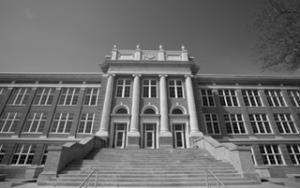 Built in 1923, Whittier Junior High School was the first middle school constructed in the United States. In 1977, the Lincoln Board of Education voted to close the school. After sitting vacant for nearly 33 years, the facility reopened in September of 2010 ad The Whittier Research Center where it is now home to three University of Nebraska research teams and the UNL childcare center. 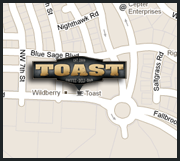 Take a look around Toast. All of the baseboard, window trim and door trim was built from wood reclaimed from Whittier. The aptly named school house lights hanging over the bar were also rescued from Whittier. And finally, the restroom doors were once classroom doors that students used to pass through each day. Mister C’s Steak House was a landmark Italian restaurant located at 5319 North 30th Street in North Omaha. 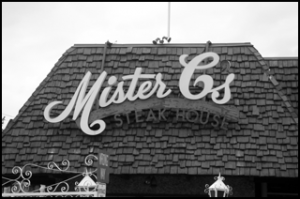 After operating for almost 55 years, Mister C’s closed September 30th 2007. The mayor of Omaha and Omaha City Council declared September 18, 2007, “Mister C’s and Mary Caniglia Day” in honor of the owners’ service to the city through the restaurant. If you are sitting at our bar, chances are your feet are resting on the original brass foot rail from Mister C’s. We weren’t able to locate the original brackets and end cap, so we used an aging process on new brackets to match the look and feel of Mister C’s classic brass rail.